Courtney works nights, and one of the things I've learned from being a night shift dad is that most people have a sliding scale for parental expectations. There's "good" and there's "good for a dad." If you're hustling the kids into church so that you can make it in time for your Bible study, and you're holding sacks of McDonalds, nobody judges you for feeding your kids junk. They're just amazed that you, a lone dude, kept the babies from starving and even brought them to church! I like to flatter myself that I'm more "good" than "good for a dad," but the one thing that repeatedly puts the lie to that is having to dress a little girl every morning. With experience, I've grown much better at it, and I can at least pull Ava's hair into a passable pony tail that stays in place until one of her preschool teachers is kind enough to redo it in the middle of the day. The problem now is that just as I'm getting good at choosing her clothes, she's grown an opinion. 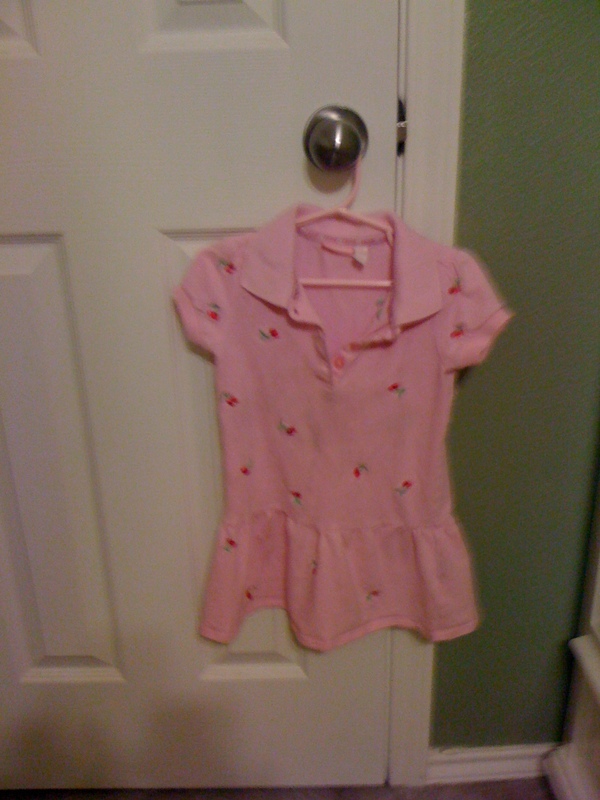 This is the very cute pink dress I tried to put her in this morning, followed by the outfit that she ultimately got her way and wore. I tried to talk her into wearing some green shorts instead of the skirt, but she wasn't having it. I decided that a purple skirt and tan long-sleeve shirt with cowboys on it was not the hill that I wanted to die on this morning. LOL, "the hill you want to die on." Charlie has gone to school many, many days with his pajama shirt still on under his tshirt. As long as all the important stuff is covered, I don't care if he's wearing his swimsuit to school! I'm a mom, and I have that battle every single day. I tried talking to her the night before about what she wants to wear. Today she went to school with a white collared shirt with a red, white and blue firework embroidered on it, paired with the Texas Tech skirt I made for her. To tie it all together she chose her pink high tops. But I'm really glad she has opinions, and a mind of her own. Even when it isn't how I'd like her to dress. "the hill that I wanted to die on" has just rocketed to the top of my favorite sayings list.